Motherhood is considered in strict biological terms as having a baby from one’s own egg, and this is the Clock Ticker’s overwhelming preoccupation. Contributors Monica, Kelly, Hannah, and Sarah the author are described as experiencing “baby panic” having postponed childbearing in order to pursue a successful career, and perhaps less successfully the Right Man. 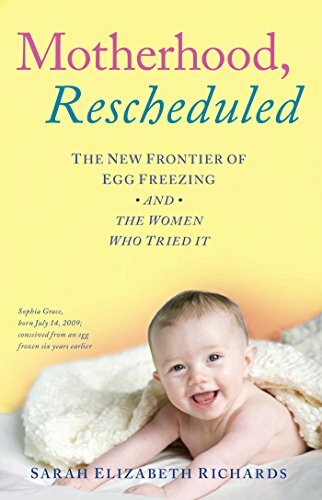 The book details the journey of each of these women in successive sections—Longings, Reprieve, Men, Time, Reckoning—though their experience is interspersed with updates on the current state of the art of egg freezing, which are perhaps the most interesting sections. Could this be a new frontier of feminist choice? Considering the price and the pain involved, probably—and many would say happily—it will remain an option for the privileged few Monicas, Kellys, Hannahs, and Sarahs who have the time and funds, or helpful parents to write their checks. In the introductory chapter the author states her two main aims in writing this book. First purpose is to answer “looming questions” as to what happens to women after they put themselves “off the clock” by freezing their eggs; do they really go on to pursue ever more fulfilling career and personal choices? And the real focus for our Clock Tickers seems to be extending personal choice with turning frozen eggs into warm babies a distinctly subsidiary aim. The second reason for pulling this information together is to redress the negative image of egg freezers as the “materialistic career girl” or the “plucky single gal” who still has not homed in on Mr. Right and to present egg freezing as a prime example of the “take charge” attitude which is one of the most fundamental American values. This highly individualistic perspective—What does egg freezing do for and show about the women who do it?—permeates the text though there are some attempts late in the book to place this activity in a broader social context. The cases of women about to undergo therapy for some forms of cancer who freeze their eggs in order to prevent them from radiation damage or women with a family history of premature menopause are mentioned, though this is not the book’s focus. Other characters in the book—in addition to the Clock-Ticking Egg Freezers—are the assorted scientists who are in favor or against the process on other than strictly medical grounds. The redoubtable British embryologist who has been against freezing for Clock Tickers converts in the end. The text is peppered with doctors’ requests for $10,000, $12,000, and $14,000 and moves along at a hectic pace toward the dénouement, despite extended passages on auto-injecting “into my stomach an inch below the belly button” and grueling episodes with ovaries being nudged by vaginal probes. By page 211 author Sarah has spent $50,000 of her own and her parents’ funds to freeze 70 eggs stored in three different locations. With the exception of Sarah who provides almost more detail than is strictly required to support the argument—“I am extremely sensitive to hormonal changes . . . to the point that my parents counted down my periods until I left for college”—the individuals are difficult to distinguish from each other, though Monica’s Filipino heritage is referred to from time to time. Their high-flying careers which have kept them from procreating are also not clearly delineated, though sales and marketing seem to feature, no doubt coincidentally. Perhaps the fact that parents—even after their own divorce (Monica again)—are prepared to provide financial support suggests some less than high-flying careers and maybe an unusual degree of parental involvement in adult daughters’ fertility? Therapists are also on line to guide the journey. Extended passages on their internet dating experiences give large tracts of this book a women’s magazine aspect: “She usually went for conservative types but . . . ’Hell , why not try the arts’ she thought. . . . It was the first time in years she had wanted to kiss someone back.” It is not always easy to determine whether the humor is intentional or not and to whom it is being directed. “Finally, over dinner on New Year’s Eve she choked down the lump in her throat and forced herself to tell him about the decision to freeze her eggs.” This soft center of the book cries out for speed-reading . . . or hysteria. And was there a happy ending for Monica, Hannah, Kelly, and Sarah? While only two of these adventures ended in a warm baby, Sarah believes that having those eggs in the freezer freed all of them from baby panic and enabled them to feel “in command of their own destiny” and so have more fulfilling lives. In the Epilogue she reports increasing endorsement from the medical establishment and greater demand from women of ever younger age groups. The epilogue touches briefly upon some of the individual and societal consequences of having more elderly first-time mothers, but curiously does not raise the usual issues of more balanced parenting, or family friendly social policies and work-places which have made combining motherhood and a career a reality in an increasing number of countries. Does Motherhood, Rescheduled: The New Frontier of Egg Freezing and the Women Who Tried It convince us that the Clock Ticking Egg Freezers are America’s unsung heroines? Hardly. But it provides enough information for Clock Tickers out there to decide whether this is an empowering way to go.